This story melted my heart, but not for Rory. It melted for Daniel. Yes, Rory was going through a metamorphosis and becoming his own butterfly, and at times it was beautiful and funny. But the true story for me was Daniel and how he was able to open up and be honest with someone about his mental illness, who could very easily turn him away. Daniel’s character was written quite well and with so much heart and soul. Daniel just broke my heart but Rory was able to piece it back together. I enjoyed watching Lawrence become Rory and for the most part, trust in himself, and be strong. Rory had to be strong for Daniel. Daniel and his rules were just what Rory needed to be able to accept himself. Yes, rules in general for a relationship may be silly but for these two, they truly were what made them shine. Supporting characters were there to help shine the line. Barry was just so fabulous, you want him as your best friend. Becky can kick some serious shopping and yet would be not be my favorite gal as I do not like shopping at all. Stacy was there for Rory so he could be there for Daniel. Overall, this story was full of learning how to accept support, and to ask for support. Mental illness is very much alive in the world that people do not want to talk about. I applaud Mr. Doyon for bringing such a beautiful character, Daniel, who has a mental illness forward and proud and then Rory, to who loves Daniel deeply and wants to be there for him. Becoming Rory is a very emotional book. It touches on some serious subjects such as mental illness, drug use, gay bashing, and being outed to others without permission. But it also touches on subjects such as acceptance, love, and new beginnings. Rory was outed by a bully his previous year in college and has decided he is tired of hiding so he decides it is time to reinvent himself and becoming the person he wants to be instead of hiding behind a mask any longer. On the first party of the school year, his life changes when he meets Danny. Rory is so much stronger than he realizes. He could have hidden after being outed or he could have changed schools but he did not. He came to school and faced his fears and decided to embrace who he is and not let fear rule him. He is also strong because when he found out about Danny’s illness he could have walked away and instead he met the illness and challenges that come with mania head on and did what he had to in order to help Danny when mania overtook him. Rory is an amazing person with so much love to give that I think that Danny found the one person who will never leave his and will instead brace whatever comes their way without giving up. I do not think that Danny ever expected to find the type of love that he has for Rory or the type of love that Rory has for him. He never expected Rory to stand by and help him when he cannot help himself and is amazed to finally realize that he has met his sole mate. This is an amazing story and I hope others will read it and take away from it what I have. That love is not meant to be a passing ship and that you give up when times are hard. Love is meant to be cherished in the hard times and in the good times. It is meant to be lasting no matter the situation when you find the person that makes you whole. It was quiet. Rory knew that wasn’t normal. He gazed out the windows. The angle of the building meant that one side was faced toward the campus, a miniature city full of towering buildings scattered in clumps, the other faced the mountains and woods. Two contrary images. It appealed to his poetic soul. That was a part of Lawrence he had no intention of letting go. It spoke to his core, that love of words. Rory opened a window against the heat. Wentworth was an older building, and Rory half expected in winter that he’d have to keep the window open just to breathe. For now though, with no air-conditioning and a fan that did nothing except when pointed at bare skin, an open window was a welcome reprieve from the late August heat. There wasn’t enough of what he wanted Rory to be, not yet, for him to be comfortable with naked skin—at least not his naked skin. His dorm room was taking shape. The books were on the bookshelf, two deep. An index card on the end of each shelf cataloged the books on the back row. They were books he wouldn’t want often, but when he wanted them, they’d be easy enough to find. Each shelf had a theme. On each shelf his favorites were in alpha order in front, and those he’d brought only out of fear his dad wouldn’t… Rory closed his eyes and took a long breath. 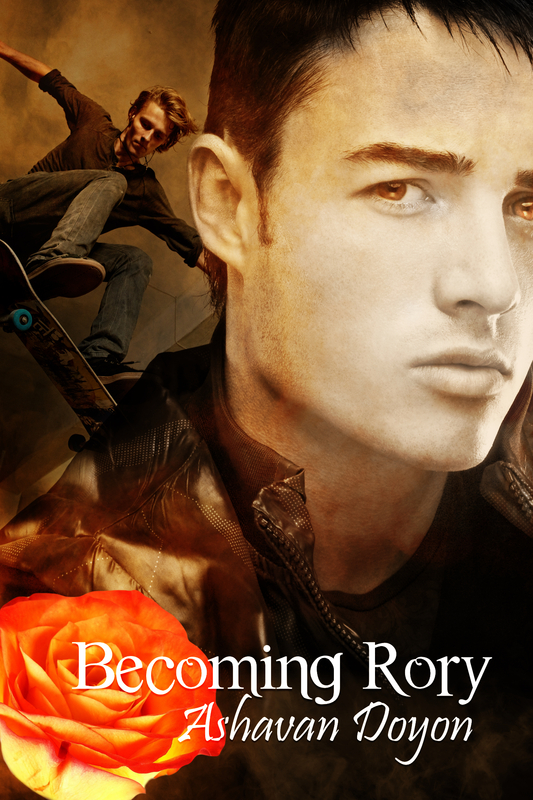 There were reasons for his rebirth as Rory, and not all of them were here at school. The boxes for the books were broken down and in the back of the closet. His clothes were hung up or carefully folded and in drawers. They spoke of Lawrence, not Rory, but they were what he had. It would be easy to fall back into wearing these. He’d have to for a little while. Clothes cost money, and for the first time in his life, Rory was not confident a call home would yield any more, not even for clothes. Especially not for clothes. What’s wrong with the clothes you’ve got? It’s what his dad would say. Probably his mom too. With three beanbag chairs, the chair for his desk and the bed, that meant seating for five, at least. Anything over ten was considered a party. Not that he had any real hope of filling even the five spaces he had. Rory chuckled at himself. He could hope, but it wouldn’t happen. Still, he might get Stacy and Barry to join him. He walked up against the window, pinned between the steady whir of the fan and the tiny breeze from the window. It was comfortable. Well, not yet. Not really. But it would get more so over the course of the semester. He had to believe that. On the desk next to his laptop, too hard to ignore from where he stood at the window, was his student leadership packet. The college had found some money somewhere. The portfolio wasn’t the cheap paper folder he’d expected. The mock-leather portfolio marked with the school seal—embossed on the cover, not just ink—had come with a lapel pin and a school pen. Okay, so the pads of paper inside were cheap, but that the school had done that for all the student leaders who arrived early? The communications major in him couldn’t help but analyze it for the message, and it wasn’t hard for him to guess. Take this seriously; they want us to take it seriously. Rory wondered if they knew that the fledgling leaders were coming back in an hour as the sun finished its descent with the makings of a party. He wondered if Barry knew. Bronzed. Fit. Popular. Of course Barry knew. Rory glanced at the door he’d left open. He tried to pretend it was for something as mundane as airflow, but in his heart where the dull ache of the afternoon’s discussion still sat like a leaden brick, he knew better. “This is where you do something stupid, Lawrence,” he whispered to himself. He knew what he wanted to do. Want is a strong term. Maybe it’s just the only way you know how to deal with it. And your name is Rory, dipshit. Lawrence is dead. He looked again at the pile of leadership materials. How had Aidan talked him into this again? Oh, right. There was no one else. Aidan and Michael, they were gone. John Simmons was gone. All they had was a scattered and broken community. Rory looked out at the slowly illuminating lights in the buildings across campus. It wasn’t like it would be when classes started. Right now it was just dots of light here and there. Athletes. Student government. Student organization leaders. It was getting dark. The party would start soon. As a leader, he’d been invited, quietly, with everyone else. Would the athletes be there to make him feel inadequate? Rory let out a breath, slow. Lawrence would never have gone. Maybe that meant Rory needed to. He sat down at the desk and quickly flipped through the packet. Even on a cursory glance it was clear that the real requirement was to be present for the workshops throughout the week. The administration had scrupulously left the evenings to the students. It was a kindness, he noted, they had not extended to the residence life staff. He’d seen Becky and Barry earlier, making door tags for each of the residents. It would take them hours to do, and he’d wondered at the time why they’d started so early. But if Barry knew about the party… Rory sighed. Why did it matter if Barry was there? He wasn’t interested. He’s comfortable. I’ll know someone. It’ll be bearable. Rory closed the portfolio and pushed it away. His thoughts turned to how he could almost see skin under that too thin shirt of Barry’s. Also pretty uncomfortable. He stood up and walked over to his closet. They were nice clothes, but they all fit into a particular mode. He pushed the hangers aside one by one. White shirt. Blue shirt. Pastel shirt. All of them button fronts. Then cardigans. One after another. Trousers and corduroys. Tweed jackets. Two business suits his parents had bought him for interviews. At least one of them was sleeker and more modern. He went back to the desk, trying to stay calm, and pulled out his laptop. Two quick searches and he’d found it: what good-looking fashion models could do with a cardigan. It wasn’t Lawrence at all. That was good. But could Rory pull it off? He was no top model. Ashavan Doyon spends his days working with students as part of the student affairs staff at a liberal arts college. During lunch, evenings, and when he can escape the grasp of his husband on weekends, he writes, pounding out words day after day in hopes that his ancient typewriter-trained fingers won’t break the glass on his tablet computer. Ashavan is an avid science fiction and fantasy fan and prefers to write while listening to music that fits the mood of his current story. He has no children, having opted instead for the companionship of two beautiful and thoroughly spoiled pugs. A Texan by birth, he currently lives in New England, and frequently complains of the weather. Ashavan loves to hear from readers and can be reached at ashavandoyon@gmail.com.